THANK YOU for visiting J&J Sanitation - Providing Trash Collection and Waste Removal Services Since 1992. We provide our customers the best possible service in a courteous, effective manner, showing respect for those we are fortunate to serve. Our goal is to create an environment where our employees strive to create positive impacts through interactions with customers, communities, and fellow employees. 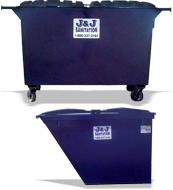 As a leading trash collection and recycling company, J & J Sanitation is devoted to our customer base and their garbage collection and waste removal service needs. We make residential garbage pickup easy, and place an emphasis on quality customer service. From scheduled trash collection to special pickups, our experienced and friendly drivers can be counted on for all of your waste removal service requirements. J & J Sanitation is dedicated to providing dependable, quality, and flexible commercial waste removal service to our local communities. Our professional staff will work with you and ensure your commercial trash collection needs are met. Different-sized containers are available, from small or large dumpsters to full-sized roll offs. For residents and businesses who require larger scale waste removal services on a regular basis, J & J Sanitation provides a wide variety of rolls offs and dumpsters. You can rest easy knowing all of your garbage and debris is safely contained. J & J Sanitation is dedicated to providing you with a cleaner environment and we work hard to make recycling easier and more convenient for everyone with Single Stream Recycling. We take the hassle out of recycling and take care of sorting your recycled items at our state of the art facility. To make an inquiry, please contact our customer service department or give us a call at 402-336-1334. Website Development by Robert Sharp & Associates.